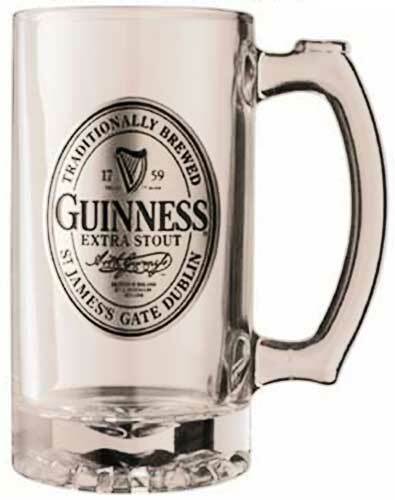 Guinness mug is a glass design that features a pewter Guinness extra stout emblem. This Guinness tankard is a 16 ounce mug that features a pewter badge with the famous Guinness Extra Stout label along with the iconic harp logo. The Irish Gift House ships this Guinness beer mug in a gift box. Guinness Extra Stout label is features on this hobnail style glass beer mug. Guinness tankard is crafted in the classic black and cream colors and it features the Guinness label. Guinness tankard features a pewter emblem that is enhanced with the iconic Gilroy toucan.